Well, no sooner did I post the previous WIP shots, that I decided to push through and finish the model. 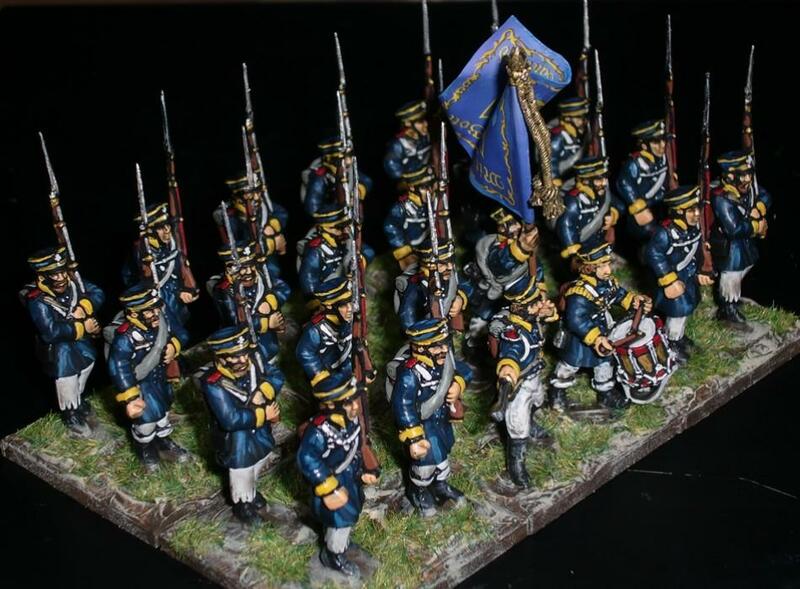 Actually only the red trousers and green dolman and pelisse were needed - as well as the basing. I think this Stadden is the last of the 54mm metal figures that I had from days gone by - I've kept them with me since childhood (well more like my early teens). He's on a 40mm Warmachine base; which is cool as it makes him look like a gaming figure. He comes with a carbine, which I still have, but since he's supposed to be an officer, it's left off. The Baden Hussars were renowned cavalry, and participated in the "Charge of Death" at Studianka against a much larger Russian force. 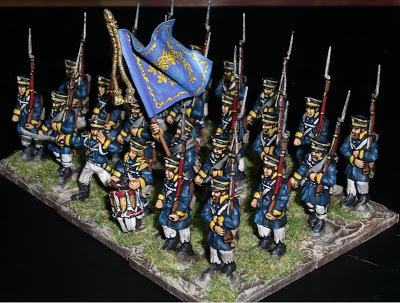 Only about fifty hussars survived the charge. Yet another old 54mm figure in the process of being re-painted. So far, just the gold (which there is a lot of) and scarlet facings - as well as straps and belts. He'll be painted up as an officer of the Baden Hussar Regiment in full-dress. I just love the green and red combination; not to mention the green Hessian boots. The sabretache design is supposed to be the monogram of the Grand Duke of Baden, "C F", with a crown above. 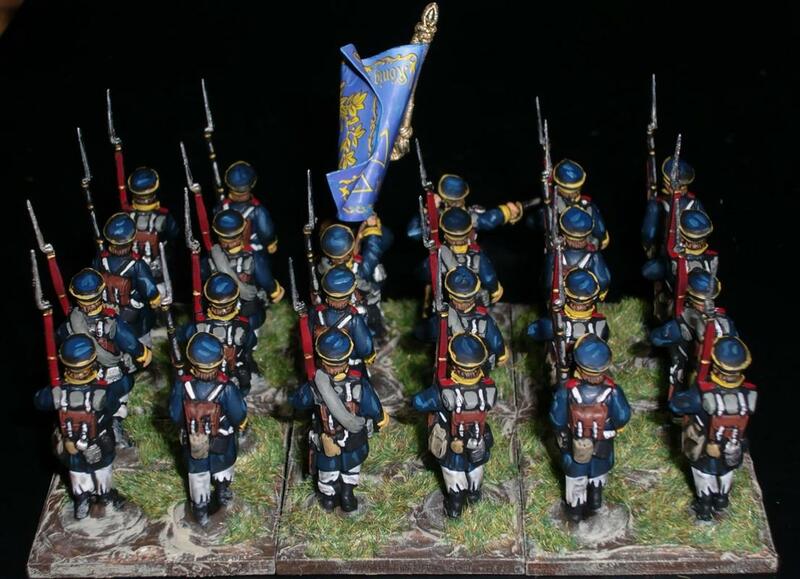 I've had this model for over 35 years and he was previously painted up as an officer of the French 9th Hussars. He'd been banged around and dropped during the numerous moves while I was in the service. Being an older sculpt, he is a bit stiff looking, but the quality of manufacture is impressive. For instance, real wire is used for the pelisse lanyard, and the straps for the sabretache and sword scabbard have been soldered on. "Ah, Assyria, the rod of my anger; the staff in their hands is my fury!" - Isaiah 10:5. Another old 54mm figure that has been repainted - this one an Imrie/Risley Assyrian archer. The figure was repainted, but the horse was left with most of its original paint and only given highlights. The horse's mane and tail weren't even highlighted with dry-brushing - guess I've learned a bit with 28mm figures. The figure was modified a bit by having the original scale armor cut with a knife to look more like lamellar armor. The pteruges were made from putty, as the original figure lacked these. The helmet has had the bare metal polished and coated with a protective finish. I'm glad I kept this figure for all these years. Maranatha! 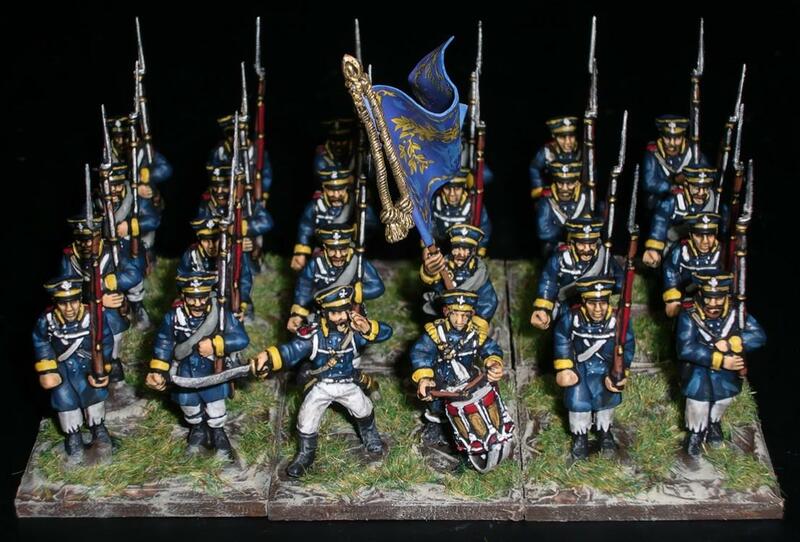 Thanks to a free download from Wargames Designs of a very nice lance pennant, the Winged Hussar is completed. The lance is a brass rod with a plastic bead for the hand guard. The lance head was fashioned from plastic sprue. Polish Hussar lances (kopia) were very long - about 4.5 to 5.5 meters which tended to outdistance their enemies lances. This site contains some interesting information on the weapon. Here are some close ups of the figure. Painting him was sort of cathartic - I don't feel I "have" to get a box of those Warlord Games Winged Hussars - at least for the time being. 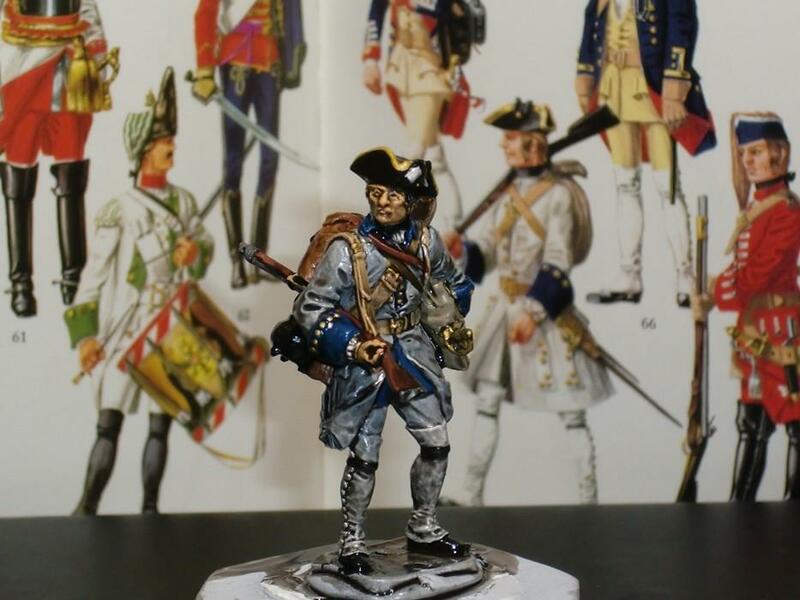 Here's another old 54mm figure I decided to re-paint. Not sure of the maker, but I've had him for over 35 years or so. Part of the reason I decided to re-paint him was due the two wings being broken apart. They were fixed with some pinning and Green Stuff. The metal turned black after soaking in Simple Green to remove the old enamel and oil-bassed paint. After I finish this guy, and possibly a couple more old 54mm models in various stages of disrepair, I will get back to 28mm figures. I just don't want these guys sitting around collecting dust - or worse, thrown out in momentary lapse of judgement. Here he is - based on a Warmachine 40mm round base I just picked up from The Game Matrix today. Highlighting has been added after the Minwax stain. The face was given a little detail work too, but otherwise, this 54mm figure was painted and based pretty much the way I do 28mm figures. 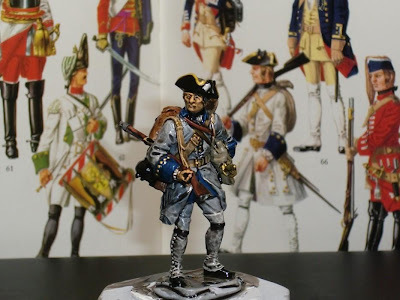 As I mentioned in the previous post, I've had this figure for many years and recently stripped the original paint work (done when I was a kid) and repainted it using the methods I use for 28mm figures now. The Royal Roussillon Regiment's second battalion participated in most of the major engagements in the French and Indian War. Several other regiments sent their respective second battalions to "New France" for the service during the war. As you can see the basic load for infantrymen hasn't changed much over the centuries. 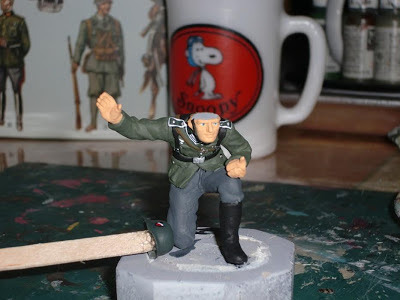 Here's another old figure that I've had for decades that is in the process of being re-painted. It is a 54mm metal figure that I originally painted back in the 1970's as a youngster. Here it is with a wash of Minwax Tudor Satin stain. He's a fusilier from the Royal Roussillon Regiment that was heavily involved in the French and Indian War, including the Siege of Fort Ticonderoga in 1758. The unit won honors at this battle; which the French call the Battle of Carillon. Here's the figure with a block paint job prior to the wash. 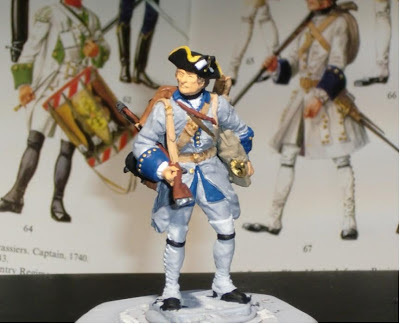 I'm now thinking of getting some excellently sculpted figures from 28mm Conquest Miniatures. Here's another figure dug out from a box from the past. It's a 1/25th scale metal figure from Tamiya released in 1974; and apparently discontinued. My mom bought me the kit when I was kid back in Hawaii, so its about 40 years old! I had painted it, but stripped it with Simple Green and just re-painted it. The magazine for the MP40 was broken off and lost decades ago; a new one was fashioned from plasticard. The front sight is also fabricated from plastic. Binoculars also come with the kit, which still exists, but I decided to leave it off. It would've hung around his neck. Too much clutter in that small area already, I think. The helmet emblems are hand-painted, and the eagle on the left side is more representational if anything. I believe the kit came with a canteen, but it must've been lost too. It would've gone on top of the bread bag. It might still be somewhere in another hidden box of junk. He's painted in early-war uniform - with closed dark green collar and grey trousers. A little bit of green was added to the Vallejo Field Grey for the tunic. The figure was painted pretty much like how I now paint 28mm figures. In fact, after a basic block paint job, he was given a Minwax Tudor Satin stain, followed by highlighting. The photo below shows the figure prior to the staining. 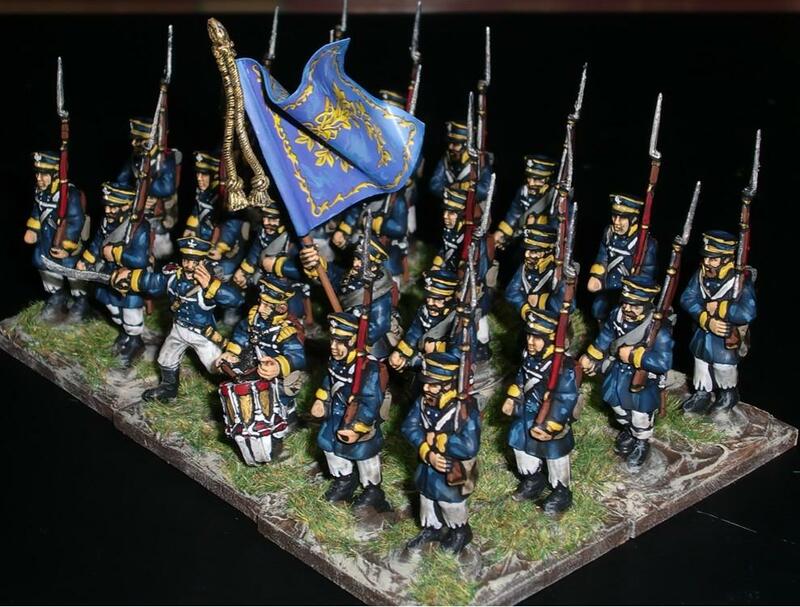 Here they are painted up as a unit of 2nd Silesians. I liked the combination of their yellow facings and red shoulder straps. Some Silesian Landwehr units are recorded to have worn the "Stovepipe" shako with a large cross - which would make them look pretty unique, I think. The colours chosen are noted as "conjectural" - in fact, Landwehr units weren't officially authorized colours, but were known to have carried them in battle; at least by some. 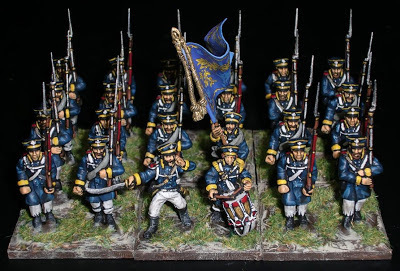 I think this set by Warlord is a pretty good choice for building a Prussian army as almost half the Prussian army was made up by Landwehr units after 1813. As I use 24-man battalions for regular sized units with Black Powder, there are 6 left over marching figures from the 30-figure box. The box contents are 27 plastic marching figures in three different poses, along with three metal command figures. It also contains several unit colours on the information sheet. I've based them on 40mm square (3mm thick) plywood bases from Litko. Actually, these 6 bases are the last I had remaining from a pack of 100 bases.